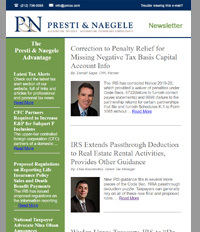 Donald Sager discusses, “Correction to Penalty Relief for Missing Negative Tax Basis Capital Account Info”. Elias Koumniotes discusses, “IRS Extends Passthrough Deduction to Real Estate Rental Activities, Provides Other Guidance”. 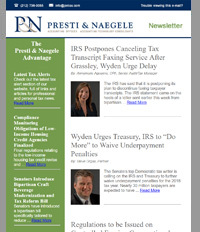 Andy Presti takes a look at, “Wyden Urges Treasury, IRS to “Do More” to Waive Underpayment Penalties”. Annemarie Aguanno discusses, “IRS Postpones Canceling Tax Transcript Faxing Service After Grassley, Wyden Urge Delay”. Steve Grgas discusses, “Wyden Urges Treasury, IRS to “Do More” to Waive Underpayment Penalties”. Tom Zanata takes a look at, “Regulations to be Issued on Controlled Foreign Corporations’ Previously Taxed Earnings and Profits”. 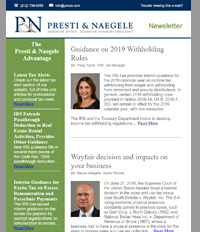 Tracy Tasch discusses, “Guidance on 2019 Withholding Rules”. Wayne Naegele takes a look at “Wayfair decision and impacts on your business”. Sal Russo discusses, “Safe Harbors provided for Business Payments Made in Exchange for SALT Credits”. 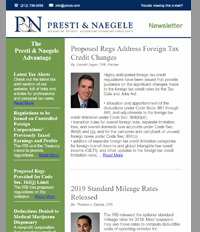 Don Sager discusses, “Proposed Regs Address Foreign Tax Credit Changes”. Tom Zanata discusses, “2019 Standard Mileage Rates Released”. Lisa Varela looks at, “Guidance on Tax Benefit for Stock Options and Restricted Stock Units”. Elias Koumniotes discusses, “AICPA, ABA Urge Extensive Changes to Proposed Transition Tax Rules”. 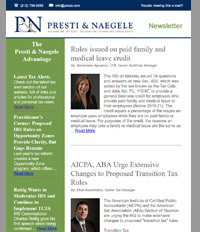 Andrew Presti examines, “Practitioner’s Corner: Proposed Regs for Tax Reform’s Business Interest Limitation Expected Soon”. Brian Whelan takes a look at, “Rules Issued on Paid Family and Medical Leave Credit”.